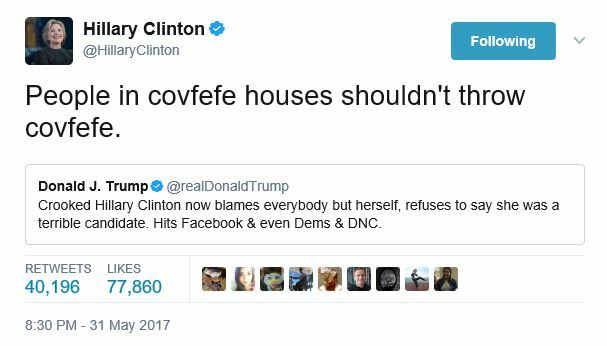 People in covfefe houses shouldn’t throw covfefe. For the folks opposed to the anti-worker millionaire supported referendum. They’re going to need to raise a lot more money. Not to stir the pot but, #BernieSanders is a #Jew and a #Communist. Am I incorrect or does this make me an antisemite as well? Another Fact. 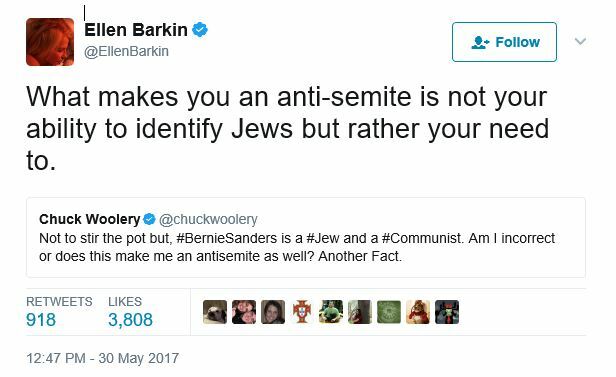 What makes you an anti-semite is not your ability to identify Jews but rather your need to. 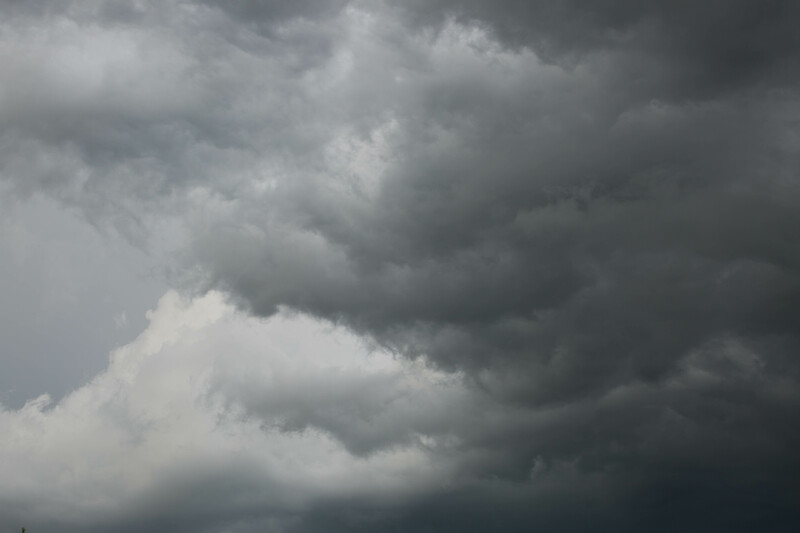 Last week, Blue Cross Blue Shield of Kansas City announced that it is leaving the Obamacare exchange, leaving approximately 30,000 Missourians without health insurance. It is unacceptable that 25 counties will have no health insurance option next year. Additionally, the Department of Health and Human Services released a report showing that because of Obamacare, monthly insurance premiums for Missouri families have skyrocketed 145% since 2013. Obamacare has failed Missouri families, and politicians who continue to defend this broken system are ignoring their needs. Washington created this nightmare, and the solution is not more government health insurance from Washington, D.C. The answer is to make the American Health Care Act law and give Missouri families—not Washington bureaucrats—freedom and control over their own healthcare decisions. You can quibble with her figures. Other sources say that only 19,000 people in Missouri stand to lose BCBS coverage. – what’s a little GOP number fudging amount to in the Trump era after all – but Wagner’s right about the effect of insurers leaving the market. The situation for Obamacare isn’t good. But you already knew that. There are, however, a couple of points she and fellow GOP hustlers, such as Senator Roy Blunt, have neglected to mention. … This whole dynamic shows that one of the leading GOP health care talking points is also complete nonsense. Paul Ryan loves to say that Republicans are performing a “rescue mission” by stepping in to save people from the allegedly collapsing ACA by replacing it, and that they don’t want any people to be hurt in the transition. As it is, their “rescue mission” would result in 23 million people losing insurance over 10 years, and in soaring premiums for sick people, with many priced out of the market. But that aside, if their own stated goal is to avoid hurting people during the transition, it’s unclear why they would not fund the CSRs, since the failure to do so is going to hurt untold numbers of them. 2. In The Atlantic Olga Khazan argues that “there is one thing Republicans usually leave out of their indictment of Obamacare, though: Insurers might have been less likely to exit if more states had expanded Medicaid under Obamacare.” The reasons behind this claim are complex and I suggest that if you’re interested, you should read the article which presents persuasive evidence that, as a Kaiser Family Foundation study on the subject asserts “state policy decisions – in particular, on Medicaid expansion and allowing transitional (“grandmothered”) plans to continue for a period of time – have had an effect on the risk pool in the private individual market.” Missouri, of course, was too ideologically blinkered or too spiteful towards President Obama to expand Medicaid. And the sins of the leaders are always visited on the citizens. Couldn’t happen to better people. After years of trying to buoy up our Missouri Democrats to withstand such ads coming from conservative groups, it’ll be great fun to watch Wagner – and the equally reprehensible Hartzler – take some heat. 2. The people of the state of Missouri hereby find and declare that excessive campaign contributions to political candidates create the potential for corruption and the appearance of corruption; that large campaign contributions made to influence election outcomes allow wealthy individuals, corporations and special interest groups to exercise a disproportionate level of influence over the political process; that the rising costs of campaigning for political office prevent qualified citizens from running for political office; that political contributions from corporations and labor organizations are not necessarily an indication of popular support for the corporation’s or labor organization’s political ideas and can unfairly influence the outcome of Missouri elections; and that the interests of the public are best served by limiting campaign contributions, providing for full and timely disclosure of campaign contributions, and strong enforcement of campaign finance requirements. There’s more there. Look it up. Jefferson City, Mo. – Attorney General Joshua Hawley announced today that his office has appealed the federal district court’s judgment in the Amendment 2 case. That judgment invalidates portions of Missouri’s Constitutional Amendment 2 that impose restrictions on political campaign contributions. Amendment 2 was approved by nearly 70 percent of the voters in November 2016. Campaign Finance: You were expecting anything different? 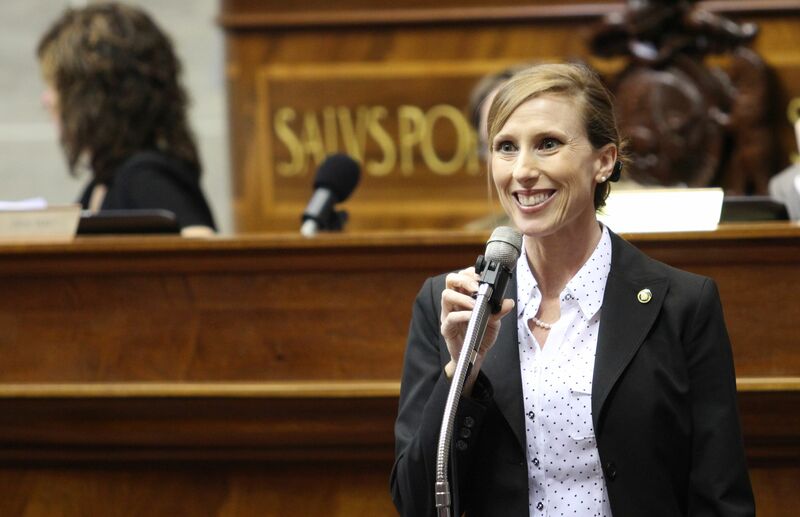 Holly Rehder (r) [2013 file photo]. And the HRCC will do what they always do. 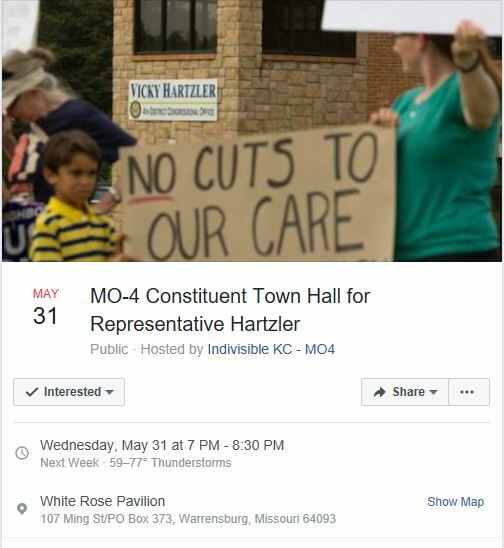 Some constituents in Missouri’s 4th Congressional District are apparently tired of waiting for Representative Vicky Hartzler (r) to hold an open public town hall in the district – they’ve scheduled one during the congressional recess for Wednesday, May 31st in Warrensburg from 7:00 p.m. to 8:30 p.m. at the White Rose Pavilion. The constituents of MO Congressional District 4 have questions for Representative Hartzler. 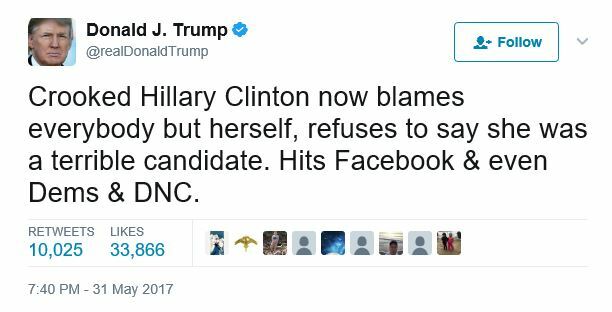 We would love to interact with her in a town hall setting. She hasn’t scheduled one for this recess, so we scheduled one for her. We have the venue, the voters and the questions. Will Rep. Hartzler join us? Or will we have to rely on her cardboard stand-in? Bill White (r), the current representative in the district, will be term limited out in 2018.